Lobia or jurga as it's called in my in-laws place end up most of the time as lobia masala or some time I pair it up with any other vegetables. 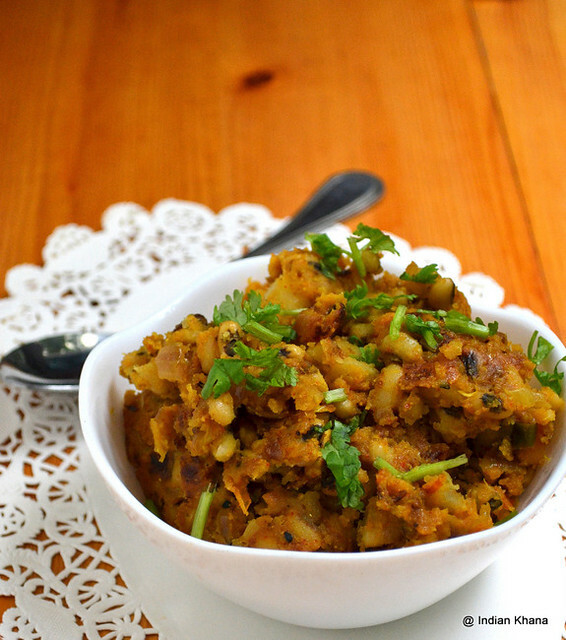 This time paired lobia with classic potato to make a dry curry. 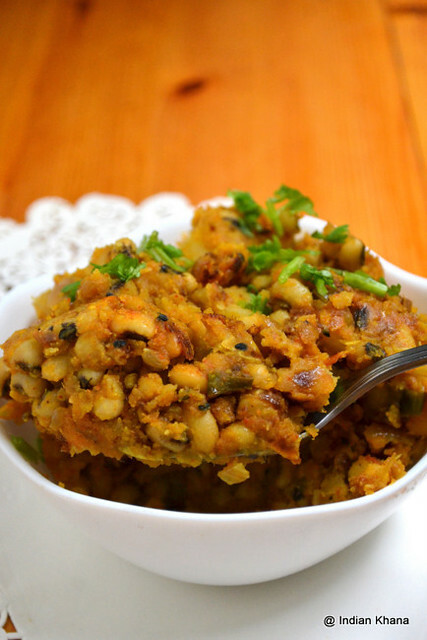 This goes well with roti/paratha or great with rasam rice. I have mashed potato since I wanted lobia to be blend well with potato but if you wish you can just chop boiled potato and add. 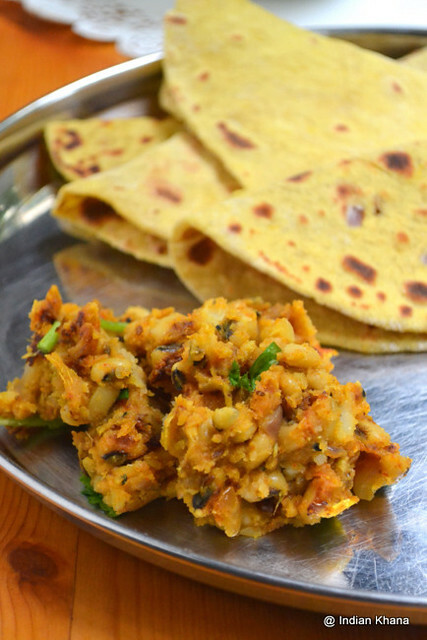 You can use this recipe to make roti wrap perfect for kids lunch box. I also used panch phoran in this recipe which created magic, basically I have anything with panch phoran it's always enhance taste of any dish, I have give list of spices used in panch phoran just add equal amount of all spices to make your very own panch phoran, store and use as required. 1. Soak lobia over night, rinse in water and pressure cook with little water, salt, bay leaf, cinnamon cardamom, cloves for 3 whistles along with potato, discard all the garam masala once cooked. 2. Peel and mash boiled potato. 3. Chop onion, tomato, chilli. 4. In a pan heat oil add hing, panchphoran and saute until splutter. Add ginger-garlic and saute until brown, add onion, chilli cook until onion becomes soft. 5. Add chilli, turmeric, coriander powders and cook for a minute. 6. Add tomato and cook until mashed for 3-4 minutes. 7. 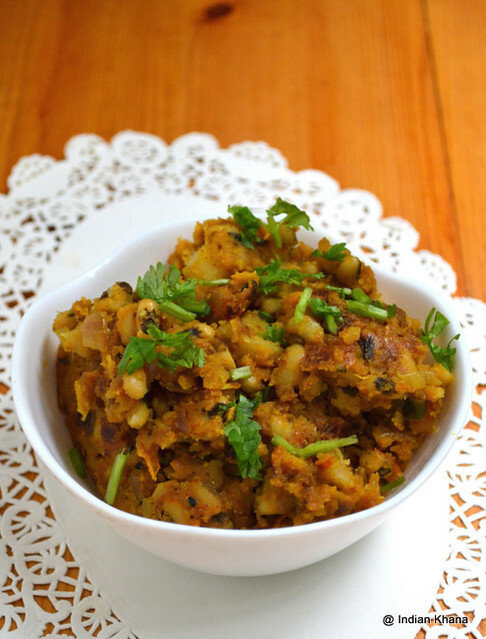 Now add poato, lobia, salt, garam masla, mix well and cook for 5 minutes in medium flame, stirring in intervals. Garnish with cilantro. Very much tempting.Gonna try with in this week. 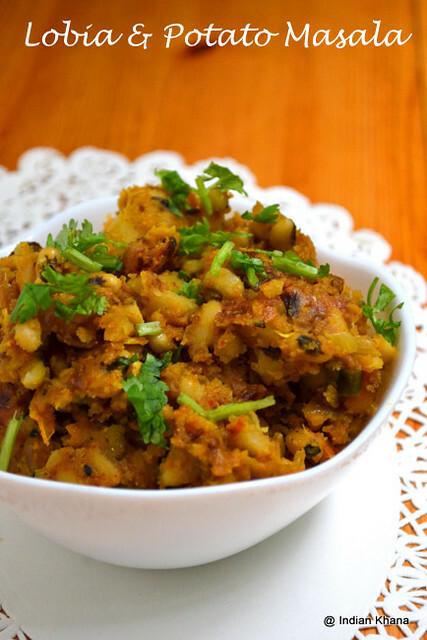 Mouthwatering potato and lobia masala recipe. excellent preparation. Guess the addition of panch phoran would have added more flavor and aroma. Love to eat it with steamed rice and rasam. Will you pass me some Priti? never heard of this it looks very good! Tempting combo.. goes well with rice and roti.. This looks delicious. Nicely presented.